Given how well Azarenka has been rising again and playing better overall, it looked like the Belarussian was ready to take out anyone expect for Serena. But Pennetta is in the zone again, upsetting a former No. 1 Maria Sharapova at Indian Wells and now she stunning another No. 1, Azarenka. Pennetta wants to possibly return at the end of the year? She can be so good that there is no absolutely no chance if she stays healthy. The German is finally playing better again, crushing her forehand and booming her first serves, but coming into the New Year, she thought that she might be able to win a Grand Slam again, but after nearly taking down Maria Sharapova at Brisbane, Ivanovic looked nervous again and she is now all over the place. She is not happy, at all. The Italian really needed the win because she hasn’t been able to best the better players, so now she will attack more often due to her confidence factor. The Spaniard has had a good last three months and now needs to rest and get ready for the clay, which she loves. The young Swiss has turned it around now she isn’t panicking. If Bencic stays healthy, watch her crack to the top 20 by Wimbledon. Bellis is very, very young, and Serena is very, very excellent and more mature. Bellis has years ahead. “Sveta” has a lot of guile and guts but Kerber has had an awful three months this year. Simply put: she has to remember that a top player who can grind down anyone if she actually believes. Try it. Halep is so confident right now that she thinks that even if she isn’t playing well, she can also figure out how to win. She doesn’t get wild like Giorgi does at times. Stephens is getting better and better and if she matures, she can be in the top 10 – or the top 5 – at the end of her year. Clearly, Nadal isn’t at 100 percent. He hasn’t won a tournament since last Roland Garros and he admitted that he is lacking confidence. Verdasco has lost to Rafa so many times, but he could tell that his fellow Spaniard was a bit shaky. He was correct and now Nadal has to sit down, talk to his parents and uncles, take a breath and just grind until he feels 100 percent again. And then he can yank every other player, especially on clay. The clay is coming very soon. As expected, Monfils was cool and calm and was more accurate when Jo returned after four months due to an injury. Tsonga will have a tough time on clay courts, but the big man he has to try. His body is ticking. The lefty Frenchman hasn’t been able to threaten to beat the big boys, but he did in Miami, stunning Stan, who has been so-so this year. Dominic Thiem d Jack Sock 6-4 6-3: The Austria youngster took out another up and coming player, when Thiem stopped the confident USA Sock. We will see both of them for years to come. Anderson is very consistent on the hard courts. Yes, it’s hard for him to beat the top-10 guys, but he can beat anyone below him, witness over Mayer. No. 3-Andy Murray d No. 27-Santiago Giraldo 6-3 6-4: The Colombia has been pretty impressive over the past year, but Murray seems to have watched everyone, so he knows exactly where he can go. Tomic was right there in the second set, but Berdych nailed a couple of huge shots and repelled him. The Aussies has played almost every week since the start of the season and needs to rest – badly. He has improved a lot but he does not want to burn out. Carolina Wozniacki vs. Venus Williams Venus has been better over Wozniacki essentially forever, owning her head to head 6-0, beating her in three sets in the final at Auckland at the start of the year. Caro has not had a good year and she knows that this time, she has to play much more aggressive and forceful or Williams will beat her in straight sets. Even though Venus’ forehand can be great or bad, it’s thick and stronger over Caro, who frequently pushes her forehand. Why she doesn’t step into her forehand using her left leg out in front doesn’t allow her to crunch the ball. The Dane is faster than the 34 year old Venus is, but she is substantially better at the net. Let’s say Caro’s backhand and Venus’s backhand are even – their best serves down the line and cross court – but when the American is clicking with her first serve, she can hammer them at 120 MPH. Caro’s first serve improved during the last half of 2014, but she has regressed in 2015. Really the only way that Wozniacki can upset Venus is that she has to go for her shots, smoke the balls, mix it up and hit sharp angles. Winner or lose, the 24 year old has to try and not push the ball around because if she does, Venus will beat the heck out of her. Venus is not as great as she was say 10 years ago, but she is still very good. She is fresh, she loves Miami and will figure out how Caro is playing. It will be close, but Venus will win, in three long sets. season, but he is, which means that he is getting frustrated because he isn’t sure where to go. However, he is super talented and soon, he will be hitting the right shots. rver stuck in there, didn’t panic and was able to strike his forehand. Yes, he can out hit Dimitrov, but the Bulgarian will confuse him when he chops his one-handed backhand low. Dimitrov will win in three sets but it will be very tight. Is Gael Monfils ready to rumble again? It’s hard to stay: some days he is on fire, and there are other days when his knees creek and he can’t bend low. The Frenchman reached the final of Marseille and nearly beat Gilles Simon, which is fine either way, but then he got hurt again after Davis Cup he had to skip at Indian Wells. We will soon how good he feels against the Serbian Filip Krajinovic, who has been respectable this year, qualifying for Memphis, IW and now Miami. He may not be as relentless like his boss Novak Djokovic, but on occasion he will find the lines. However, Monfils will get through in three sets, even though he has never played Miami before. This time, one time, for sure? Perhaps. Angie Kerber vs. Heather Watson is on Court 9? Wow, the German is almost forgotten. Yes, Kerber has had a very difficult year, but she has reached a semifinal at a Grand Slam once, she became No. 5 in 2012, and won the Paris Indoors. Yes, this season she let go her coach go and brought in an old one whom she trusts, but still, she isn’t winning, and was crushed by Vika Azarenka at IW. However, the super-steady, very strong Kerber will come back. At the very least, she is very interesting on court. Given that many of the fans will go to watch her, and the British will cheer for Watson, it should be a terrific contest. Both like to grind, get into the points and rally. Watson has improved this year, hitting hard and moving inside the baseline on occasion. Watson must be salivating against the No. 15. However, Kerber is way over due and will out hit Heather using her ferocious forehand and win in three sets. Carla Suarez-Navvaro faces Alize Cornet in what should be a long contest, as both know each other well. They are around of the same age (Suarez is 26 and Cornet is 25), they both are not very tall and the Frenchwoman is 3-2 head to head against the Spaniard. The last time they played, Cornet beat Suarez 6-7(4) 7-5 6-3 at 2014 Indian Wells. Cornet also won at Dubai. Yes, Suarez looks better this year, who is now ranked No. 12 and could actually make it into the top 10. She mixes her one-handed backhand beautifully and she crunches some heavy topspin on her forehand. However, when she is happy and confident, Cornet focuses and knows exactly what she should do. But this year, she has looked unsure of herself. Suarez will win in straight sets. Andy Murray and Donald Young once had a terrific year at the 2011 US Open and the American was very aggressive and caned with his forehand during the first week, but then the Britain was more composed and took him out in three sets. They know each other pretty well, and both know that Murray can attack with his deep backhand to the right and the left. Against Young, he also has a bigger first serve and with is cute volleys. Murray, who recently bested Young in Davis Cup last month, will win again, this time in Miami by winning in two sets. Rafael Nadal and Nicolas Almagro have played tons of ties, mostly on clay, and Rafa has beaten him every time, except last year, when Almagro stunned him at Barcelona. After that, Almagro was out of much of the year due to an injury, but he has looked fairly decent during the past six weeks. However, even though Nadal became hurt the other day, what he can eat him alive with his left forehand against Almagro’s one-handed backhand. Nadal is much more confident on hard courts and he win in straight sets. Here is an upset: Stan Wawrinka is slumping again and Carlos Berlocq wants to show off in front of Argentina/Miami USA. Take Berlocq in three sets. Late at night, the American Tim Smyczek will face Jo Tsonga who is back after an injury for the past four months. Yes, Tsonga is substantially more powerful, but Smyczek loves the large stadiums and will upset the Frenchmen in three sets. Another American, Jack Sock, had a fine Indian Wells and already has a lot of confidence. He will go up against Fabio Fognini, whom he took him down in the doubles final. While the Italian has more variety, Sock has a bigger serve and forehand and win in three sets. Nicole Vaidisova was ready to reach the top, but more than four years ago, the former No. 7 retired out of almost nowhere when she was only 21 years old. Now she is back and trying again but it is very difficult to figure out exactly how she can play. Back in the day, she always could crush both her forehand and backhand and also ran fairly fast. But is she ready to stun the No. 3 Simona Halep on Thursday? Not yet because the Czech just started last September and she still has miles to go. At the very least, Vaidisova will push her for a little while, but the Romanian will win in straight sets. Two other picks, Victoria Azarenka vs. Jelena Jankovic and Sloane Stephens and Madison Keys. Both are very difficult, because “JJ” rose again after she reached the Indian Wells final and then became scared at the end and lost. Keys, who reached the Aussie Open final, has been a hurt since February and has been erratic. Azarenka wants to become No.1 again and she knows JJ up and down and will out-slug her, winning in two sets. At Indian Wells, Stephens played better than she did since 2014 Roland Garros so now it looks like she is ready to roll. She is an excellent player who is underrated – when she feels like playing. Keys has a substantial better serve, but Stephens can stay inside the box and whales away. She will best Keys in three sets. Venus Williams faces Urszula Radwanska, who has played much better this year, being able to qualify at five different tournaments. The 24 year old qualified in Miami, beating CoCo Vandeweghe in the first round. She can be very aggressive and consistent, although she doesn’t mix it up all the time like her elder (and better) sister Aga. Venus didn’t play Indian Wells so she will be fresh and ready to rock early and often. Urszula Radwanska will be a bit tired, but she will feel strong during the first two sets. However, Venus will takeover the net and will win in three sets. Daria Gavrilova of Australia has also played pretty very well this year, qualifying at Brisbane, winning the Challengers Burnie and Launch, qualifying for Doha and Indian Wells, where she went three sets to the eventual champ, Simona Halep. This time in Miami, she will face Maria Sharapova. The world No. 2 Sharapova played mediocre at Indian Wells when she fell against Flavia Pennetta, and Gavrilova is very fast and can smack the ball. However, Sharapova has never won Miami and really wants it this time. Sharapova will be pushed, but she will win in three sets. Christina McHale overcame Sorana Cirstea who just came back due to an injury. The American looked much better this year but she has to face Andrea Petkovic. This will be very close because the German is straining now and McHale has been more consisted, but McHale isn’t quite there yet and Petko will win in three long sets. Yes, Wozniacki fell to Belinda Bencic, but we all know that the 18 year old will crack to the top 10 by the end of next year if she’s healthy. The Dane will finally play on the baselines and take down Brengle is straight sets. BNP Paribas, India Wells, March 22– For a moment, it looked like Roger Federer was right there. Novak Djokovic had choked in the tiebreaker in the second set and lost it. He was up 5-3; he grew nervous and double faulted twice. Why was the eight-time champion shaking in his boots? The Serbian pulled himself off the floor and broke the great Swiss to go up 2-0 in the third set. He was going to cruise again. But he stopped, Federer went at him and Djokovic hit a couple ugly serves and was broken again. It was 2-1, they were even, and Djokovic walked toward his chair and smashed his racket so hard that he destroyed it in piece of meat. But he moved ahead. Then he kept cracking his forehands and backhands, then he returned everything that Federer was handling, then he kissed the lines. Djokovic won the title 6-3 6-7(5) 6-2 at the BNP Paribas Open Indian Wells. He has now won 2008, 2011, 2014 and 2015. “The experience of playing many matches in the big stage and of this importance definitely helps in these particular moments to know what to play,” Djokovic said. “The right shot and stay calm and committed only to the next ball. We are all humans. We all fall under pressure sometimes. It’s completely normal, even though I have had so much experience. Roger, as well. The Swiss has played Djokovic so many times, entering the tournament 20-17 head to head. He had beaten him the past two times at Shanghai in October 2014, and at Dubai a months ago. Federer knew how to go straight at him. He was just fine mixing him up, but he knew that the only way to win is to pound him immediately. For the most part, Federer did, but he was un-able to stroke the lines. He had to over power him with his forehands because he cannot fool him with his one-handed backhand. His serves had to smoke inside this chest, or twist it outside the box. Federer was close, but not close enough. Federer acknowledged that Djokovic rarely falls apart. He will go home to Switzerland and will train, getting ready for the clay in Monte Carlo. Djokovic has celebrate his 50th tournament win on the ATP Tour. He is now ahead of his coach, Boris Becker. He can buy a beer for his friend. Or drink a beer for himself. After all, at Indian Wells, he more than deserves it. 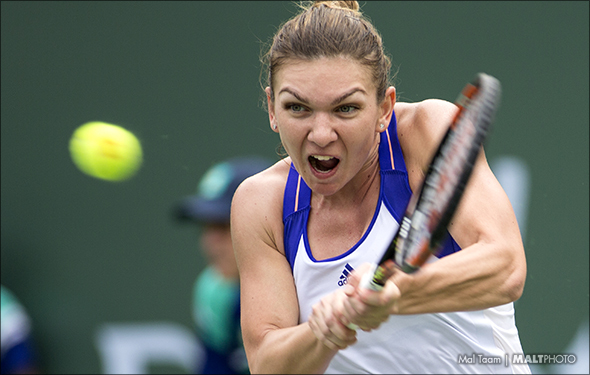 BNP Paribas Indian Wells – Simona Halep believes that one-day, soon, she can win a Grand Slam for the first time. But first things first and at Indian Wells, she grabbed her largest title, beating Jelena Jankovic 2-6, 7-5, 6-4 in the final. Both women were pretty tired at the end, ending the match at 2 hours and 37 minute. Jankovic is 30 years old and has a load of experience, but she can get frighten while the Romanian kept battling. Her feet hurt and it was pretty painful, but the world No. 3 kept on digging, moving forward on her big forehands and keeping her backhand deep. Yes, both of them had played better matches overall, but it was what it was and she still had to fight on. She did, battling to the last ball while Jankovic gave up in the last few games. This year, Halep has been pretty darn good. 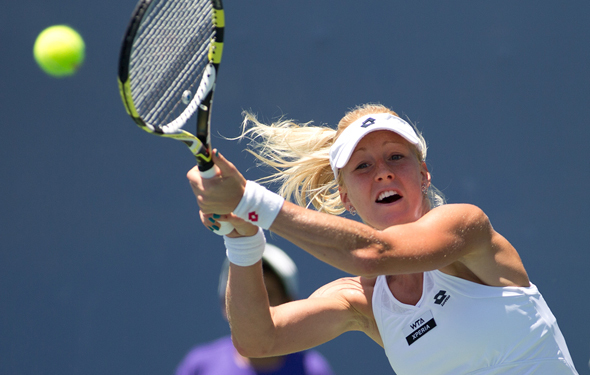 She opened the year by winning Shenzhen, beating the now good Timea Bacsinszky in the final. At the Australian Open, she went down to Ekaterina Makarova in the quarterfinals. At the Fed Cup at home against Spain, she beat Silvia Soler-Espinosa but lost to Garbine Muguruza. However, Romania won anyway. But then Halep began to explode. She won Dubai with an important match by besting Makarova, then taking down Caroline Wozniacki and then the huge server Karolina Pliskova in the final. 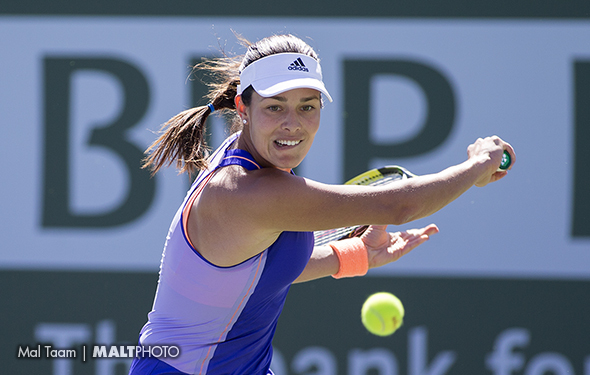 At Indian Wells, she had to battle every step of the way. She grinded by besting three sets over Daria Gavrilova and Varvara Lepchenko, beat Pliskova again, and then winning another three setter, this time over Carla Suarez. Fortunately – or unfortunately – Serena Williams pulled out with an injury so Halep had more rest before the final. She knew that Jankovic would move the ball around all day long, but she was willing to stay in there all day. Outside of Williams and Maria Sharapova, since the 23 year old Halep has been more consistent. Throw in her 2014 Roland Garros final, the Wimbledon semifinal, the WTA final and the Madrid final, and she looks like a Slam ready for a taking. She will play Miami, then play the Fed Cup again and then on to the clay. She has to prove beating the great veterans, Serena and Sharapova. She can do it, but has to let it all hang out and out stoke them. However, Halep is already very close now. “This tournament [Indian Wells] gives me a lot of confidence that I can be there, I can win every tournament, so now I have more confidence that I can win a Grand Slam,” Halep said. These two seem to never stop and it appears that they can go on and on until eternity. They have already played each other 37 times (thank you very much said Federer, who leads Djokovic 20-17 head to head). When they face off, they understand how the game is played. Yes, this is science, not a boring sport. They are very intelligent, they think about each other all the time, and will change it up when they are losing. For example, if Novak has decided to smoke his two-handed backhand across the court and not push the ball down the line so the Swiss will grab his forehand and begin to fire away, then Federer will have to chop his one-handers very low so if he gets a chance, he can rush up to the net and challenge his passing shots. If Federer is serving extremely well, he can use his serve and volley and put the ball away until Djokovic is crunching the returns super low and sharp where Federer has to back off until he can be sitting on top of the net and putting away his sharp volleys. The reason why Federer has won their last two matches in Shanghai in 2014 and Dubai a month ago was because he dictated the most points. It was very close. At the 2014 Wimbledon final, Djokovic schooled him at the very end. Who will win Indian Wells on Sunday? Last year in California, Djokovic barely beat Federer. This time, as both of the men who just said, it will be extremely close. Whoever is going to win will nail his first serves, mix up his backhands, jump on of his forehands and arrive at the nets knowing that you can put it away precisely. It’s a dead even, but once again, Djokovic will win at Indian Wells, this time over Federer in three sets. Jankovic is full of life again. The former No. 1 was fairly mediocre during the past two years, being OK at times, but she looked a little slower and wasn’t powerful enough on her forehand and serves. But over the past two weeks, she has been very solid at Indian Wells, attacking with her lethal backhand, mixing up her forehands, and coming forward towards the net and crisply pushing them away. The 30-year-old is smiling all the time, saying that she’s in the zone. However, Simona Halep has looked much better over the past month or so and she owns the Serbian 3-1. The 23-year-old is quicker, she can crunches her forehands and backhands and, even though she is short, she has a very decent big serves. Yes, Jankovic has more experience, but the Romanian has enough experience to bother her. Halep will be thrilled if Jankovic will try to out-run her, and when she has the Serbian way off the court, she will rise up and nail the balls into the corner. Jankovic won Indian Wells in 2010 and truly deserved it. Then, she still had a real chance to win a Grand Slam. Now, she looks very good on occasion, but she isn’t strong enough to go all the way. Halep has a real chance at a Grand Slam soon. But fi,rst and foremost, she has to win Indian Wells. Then we can talk grabbing Roland Garros in two months time. She must start in California, showing the world how talented she is. Halep will win in two sets. 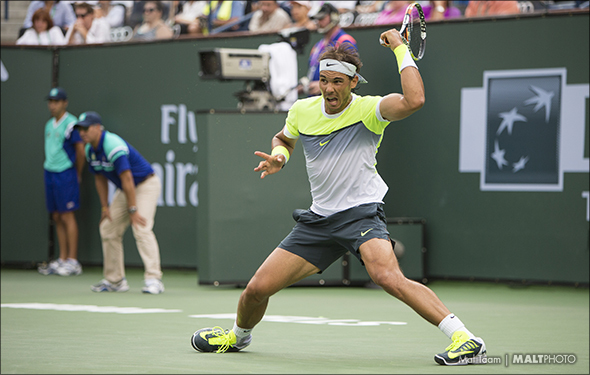 INDIAN WELLS, March 21 – Some days, you do not know who will win and why. At 8:15 pm on Friday night, Serena Williams withdrew of her semifinals against Simona Halep. Williams was psyched to win the tournament again. She hadn’t played since 2001 at Indian Wells and she may not have returned ever again, but she did, heroically. The world No. 1 played fairly well in her first four matches, besting the tricky Monica Niculescu to open, which was very difficult given that Williams hadn’t been in the court in 14 years and she wasn’t sure that the fans would actually like her and cheer for her. They did and after the first night, she could let it all hang out. She crushed Diyas, knocked out Sloane Stephens in three sets and out though the rising Bacsinszky. She was doing whatever she had to do and she was ready to play against No. 3 Simons Halep. But her right knee hurt badly. On Friday, she tried to walk fast but she couldn’t do it. She wanted to win the title, but if she tried to play, then she ripped her knee and could be out of moments. She is 33 years old and won’t last forever. If the 19-year-old Grand Slam wants to win more, maybe tying Steffi Graf at 22 majors, but she has to stay healthy. She has to be super careful. Williams may play in Miami next week, or the defending champion may pull out if her knee still aches (she beat Li Na in the final). She may play the Fed Cup against Italy mid April, and is planning to play Madrid (in 2014 she pulled out before the quarters against Petra Kvitova) and Rome (she crushed Sara Errani to win the title). But of course, she will be staring down at Roland Garros, given that last year in Paris, Garbine Muguruza shocked her 6-2, 6-2. If she is going to be able to run around on the clay, Williams cannot be stiff. While Williams was unable to win the title, at least she won when she was on the court, the fans cheered and that was good enough. 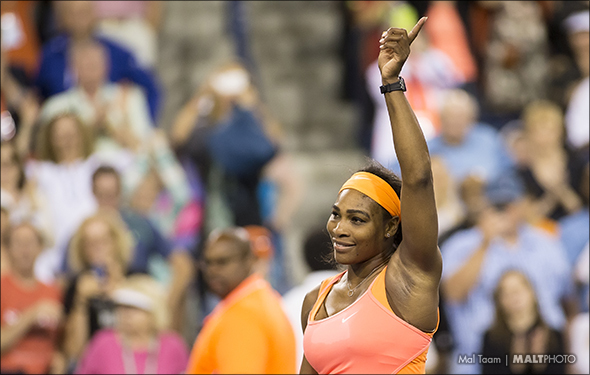 Serena will come back to Indian Wells on 2016, which is a good thing and she looks happy. She was sad trying to wait the title, but the L.A. woman was happy that the fans bowed-down and smiled at her. Since 2009, the two have faced off 10 times and have split it down the middle. The two played each other once last year, when Federer overcame Berdych at 2014 Dubai in three sets, and in 2013 it was also in Dubai, when the Czech smacked his huge serves to grab it. These two know each other quite well, so whomever cracks their first serve, move the balls around, charges the net, go super low at the backhands and strikes as hard as they can with their forehands will have the edge. Easy, right? No, but that doesn’t mean that they will miss if they are a little off. Without question, Federer has more variety, but Berdych is a little stronger from his daunting serves. Both men have played very well this week and it will be very close, but Federer has been more stylistic at Indian Wells and he will win in three tight sets. The Spaniard is looking better again, but so has the Canadian. Still, Nadal isn’t up this his usual dominance this year, as he is coming back after his injury in the last half of 2014. His forehand is not perfect, but he is swinging away and crushing from both sides. Nadal is not banging his first serves, and he needs to hit his backhands deeper, but overall, he has been respectable and very soon, he will be ready to grab No. 1 again. However, Raonic is ready. He has never beaten Nadal in five matches, but he has been reasonable close. His serve is gigantic, he has a huge forehand and he does not back off. He is not as fast as Nadal, he doesn’t return as well and doesn’t mix it up enough, but when he gets rolling he is hard to stop. The 24-year-old is ready to dance. Raonic will upset Nadal in three sets. Can anyone actually beat Serena Williams if she is playing extremely well? I doubt it. However, Williams has been down on herself at times. Look at the first half of 2014 when she was out of it and not sure why she was missing all the time. But she has calmed down and, from late July, she was been lights out. Amazingly, the No. 3 Halep looked terrific in upsetting Williams in the round robin at the WTA Final in Singapore, but they played again in the final and Williams overpowered her. Halep has been pretty darn good over the past three weeks or so and she is ready to outstroke Serena from the baseline. She might be able to because the 23-year-old is quicker than the 33-year-old, but she is not as strong off her forehand, although Halep is right there with her backhand. Even though Halep is striking her serves, they are not as big enough against Serena and she can be attacked off of her second serves. Serena badly wants to win the tournament at Indian Wells, the first time at the desert since 2001. Halep will play very well, but Serena will out think her and win in three sets. Lopez is much more steady than he once was. His left-handed service is wicked, he has a sweet stroke on the net and can be cagey. 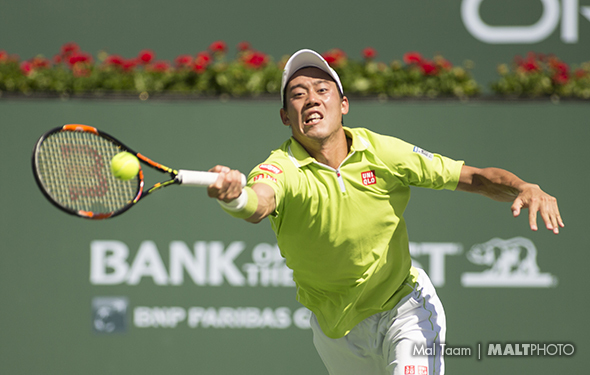 But Nishikori has a tremendous backhand and won’t be afraid pulling himself too wide. He is way faster and will pull himself to and fro until the Spanish will become frustrated. Nishikori will win in two tough sets. Halep looked extremely impressive in taking down Pliskova yesterday, returning very well against the hard server. Now she has to be patient against Suarez, who has played very well this season and is moving forward very quickly. They are both very fast and both can rip the forehands, but the backhand Halep is more effective than the Spaniard is and will mix it up on her first serves. Halep will win in three sets. Does Simon have a real chance against Nadal, who is playing better than better? Perhaps, but he is going to play as well as he can against Rafa, who’s forehand in deep, extremely solid and oh-so lethal. Simon is a smart player and he likes to run around and changing long rallies, but in order to best him, you have to outlast him. Simon will come into the net more often, and he will be inspired, but Nadal will step on his shoes in three sets. Mannarino has improved over the past year or so and the 26 year old doesn’t shy away. However, the Frenchman isn’t extremely powerful and isn’t quite sure how he will attack Murray. The Scot really wants to go deep here and he has looked pretty good this week, with his backhand has been legendary. Murray will win in straight sets. Rosol is playing better now than he was at the Davis Cup and both he and Berdych should have played at home too. 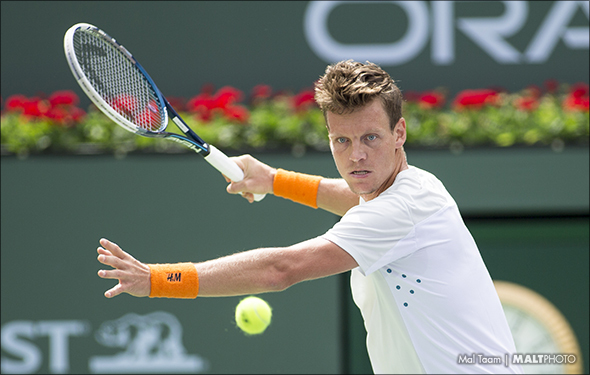 But Berdych decided not to, which helped the Aussies win at the DC, while Tomas could only shake his head. However, Berdych didn’t have to play there for hours and hours and he rested. Now he looks fresh and is ready to crack at the big boys. First, he will have not knock down a low-ranking player, which he will do, and beat Rosol in straight sets. This could be a very interesting match because the veteran Robredo looked tall when he took our Dimitrov on Tuesday. The Spaniard never quit. However, he likes long rallied and while he has improved his serves and backhands and can go deep, he won’t be able to aces after ace against Raonic, and swing away with his phenomenal forehands. Robredo will win a set, bit Raonic will grab it in three sets.